We had a quarter of a million visitors yesterday. Now that Bush is ahead, maybe the Republicans are showing up in droves to hear the good news :-) . And the good news is continuing for Bush. A new poll from Survey USA in Nevada breaks the tie and he goes ahead 51% to 47% there. Nationally he picks up five more votes in the electoral college to bring his total to 296, 26 more than needed to win. Rasmussen is now polling several of the battleground states every day and computing a rolling average over the previous 7 days or 14 days. I will include these in the spreadsheet when they are newer than what is already there. The rule for newer is the middle date of the the poll. For example, Strategic Vision (R) did a poll of Ohio Sept. 10-12, a standard 3-day poll. The middle day was Sept. 11. When the middle day of the Rasmussen 7-day poll becomes Sept. 12, it will replace the Strategic Vision poll. In theory it should be averaged with the existing poll one day earlier, but that has a small practical objection. The state graphs have a symbol for Strategic Vision and a symbol for Rasmussen but no symbol for the average of the two, so rather then marking one day as "other" I will wait until the tracking poll is actually newer before putting it in. This decision has the effect of counting the standard 3-day polls half a day longer. Senate news: A new poll by the Global Strategy group (D) in South Carolina shows the race for the Senate tightening there. Inez Tenenbaum now trails by only 3%, 44% to 41%. Although this is an open seat to replace retiring Democrat Fritz Hollings, South Carolina has become one of the most Republican states so she is facing an uphill struggle. On the other coast another woman is doing much better. Patty Murray has opened a 12% lead in her Senate race with George Nethercutt. She's the incumbent and will probably glide to an easy victory. You can view the site statistics at www.electoral-vote.com/stats but you have to mentally add about 50% to the number of visits to compensate for caching. When someone fetches a page from the server, his or her Internet provider keeps a copy on its disk. If another user asks for the same page, it is served from the Internet provider's disk and no request is made to the server. As a consequence, the Webalizer stats (which are based on the logs written by the Apache server) miss many hits. I have other ways of measuring the actual traffic, but to a first approximation, adding 50% to the Webalizer numbers is pretty close. With a quarter million readers a day, you can imagine what my mailbox looks like. It glows fiery red all day long. PLEASE, dear reader, could you pay attention to one DO and one DON'T. DO check to see if I have already answered your question before asking it. Read the Welcome message and the FAQ. Many questions are answered there. 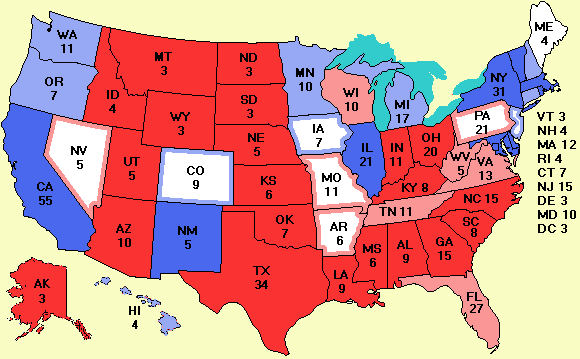 I don't know how many times I have explained what happens if the electoral college is tied. It is all explained there. Also, you can search the site using the Google box at the bottom of the page. Try 'referendum' (as in Colorado's) to see what has already been covered. Second, the "news cycle" for this site is that of a morning newspaper. It is updated once a day, usually by 7 a.m. EDT. If new polls come out during the course of the day, I note them, but don't post them. Please DON'T tell me about them. I have MANY news sources and rarely miss one. If I do miss one the next day, please check the map or spreadsheet to make sure the polling date (not the release date) is newer than what I already have. Only if I genuinely missed a new poll, which I think is fairly rare, then send me a link to it. I do read all the mail, but due to the immense popularity of this site, I can't answer it all personally any more. It was taking 4-5 hours a day. Thank you for your understanding.